Welcome to Murray's pages, which are a fun part of our larger Hedgies.com world. 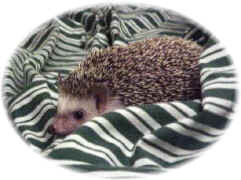 Since Hedgies.com seeks to educate hedgehog owners about proper care, habitats, health care, and so forth, Meet Murray the Hedgehog! is moving back to its original purpose of showing how life with a hedgehog can be fun for both human and hedgehog. In October, 1999, Murray was diagnosed with squamous cell carcinoma, a type of skin cancer, along her jawline. She remained healthy and amazingly happy for six months before rapidly losing weight and slipping away quietly on April 19, 2001. Please see our memorial section for Murray. 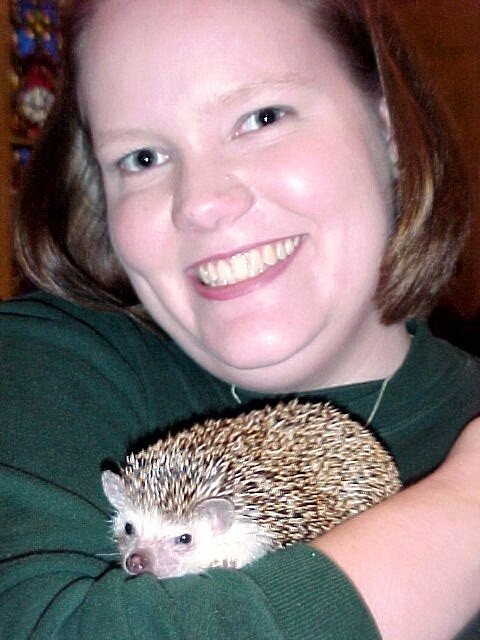 If you want to learn more about cancer in hedgehogs, please visit the Cancer in Hedgehogs section at Hedgies.com to read Murray's case study and discover other resources, including journal-style entries that I wrote to the hedgehog_help mailing list at yahoogroups.com. We have adopted a beautiful girl hedgehog named Knarla, who brings joy to our lives. While she cannot and will not replace Murray in our hearts, she has claimed a place of her own and established herself as a distinct personality. Come visit Knarla's pages. All photos (c) 1999-2004 Heather Johnson unless otherwise noted.